What is the iceberg model? Here's 2 examples showing how well it works! I had the experience again. I offered a simple iceberg model and my client seized on it, waved it around and started using phrases like “going deeper in the iceberg”. It happens every time I share it; people love it. There are many versions of the iceberg model. The original for this one came from The Systems Thinking Playbook by Linda Booth Sweeney and Dennis Meadows (thanks and respect – it’s a brilliant book). I have adapted it as I’ve used it with people. This example comes from a transformation project I ran for an arts organisation. One of the ‘hot’ presenting issues was the pickle they were in with their creative meetings. “People weren’t talking and the meetings weren’t functional. Our work is creative, about emotion and passion, but people were detached; I was flummoxed as to why people weren’t contributing,” said the meeting owner. A shift happened after a systems game when I used the iceberg model to help them make sense of their experiences and open up a conversation about the experiments they could run in their organisation. They wanted to put their energy into something that felt exciting and began talking about a new area in their building how they could set it up as a hot-desking space. It proved to be a key intervention. People from other departments began to mix with ‘the ideas people’ and take part in the informal conversations leading up to the creative meetings. The conversations shifted and the old beliefs about who was qualified to develop ideas began to dissolve – without us having to address them directly. There were other dynamics and interventions but the hot-desking space was an important catalyst for change. It seemed to unlock enough for people to begin to experiment in other areas. 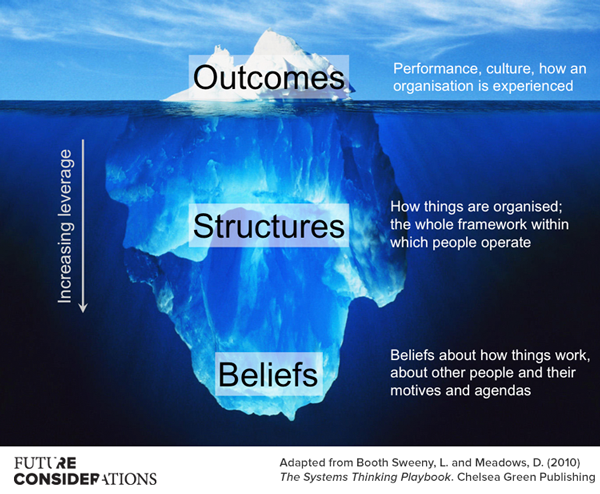 There’s another aspect to this: using the iceberg model to remind ourselves about the influence the structures and beliefs can have on behaviours – and how creative people can be in delivering exactly what you ask for. A very large, global organisation wanted to increase ‘employee engagement’ in community investment across their offices around the world. ‘Engagement’ was defined as ‘the number of employees participating’ across a of programmes and a high target was set. The retail guys rolled up their sleeves, delivered some amazing projects, raised a record-breaking amount of money for charity and moved the dial on brand loyalty with some great local PR. Employee satisfaction moved up a notch with community participation cited as one of the top 3 reasons to work for their part of the organisation. They did a great job – but missed the participation target. I (Lycia) help people think and act systemically based on the science of how complex systems work and evolve. Click here to get in touch. Originally posted on LinkedIn, 10 Oct 2017.
i have not used the model however, i would like to employ it to develop a model on Literacy. may the Tree Iceberg Model be ideal to explain literacy as dynamic. usually different groups of people on view the trees branches and not roots same as literacy where people mostly view it as acquisition of basically reading and writing. but, it is more than that. 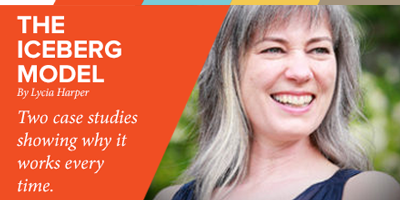 help me develop the iceberg model for literacy borrowing from the cultural iceberg model. What a great vision you have to combine these two ideas! We haven’t yet explored the idea of developing the framework any further, however, we are running a workshop to help more people experience the Iceberg model for themselves. Perhaps you would like to be involved? Click here to request an invitation to attend the workshop.